Over the past several weeks, longstanding tensions on the Korean peninsula have intensified. 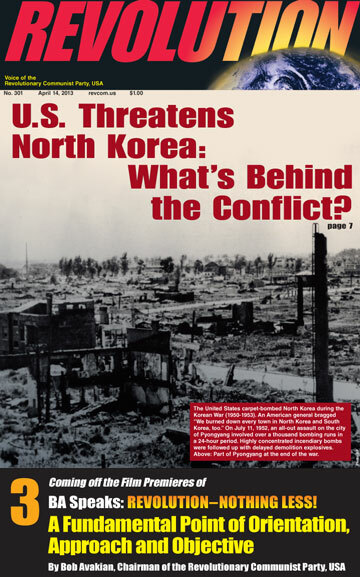 U.S. diplomats, news media, and political leaders have portrayed the small, impoverished nation of North Korea (formally the Democratic People's Republic of Korea) as a belligerent bully, a threat to its neighbors, and a nuclear-armed threat to world peace. We will discuss this the current crisis and potential of a major war, and the underlying factors driving conflict between the U.S. and North Korea , the compulsion on the part of the U.S. to dominate the world, -- and why people here need to oppose any US moves against North Korea. U.S. Threatens North Korea: What's Behind the Conflict? Who’s the Real Nuclear Threat?